Despite popular belief, cognitive decline is not a normal part of aging. While many people begin to slow down as they age, it has more to do with life events and lifestyle choices rather than a forced decline brought about by aging. If you live in a senior living center or retirement community, like Pine Hills Retirement Community, you already know that getting older does not mean you have to slow down. Many seniors are able to live very active lives, right into their second century! A decline in memory, reasoning, and thinking may indicate Alzheimer’s Disease, not just aging. 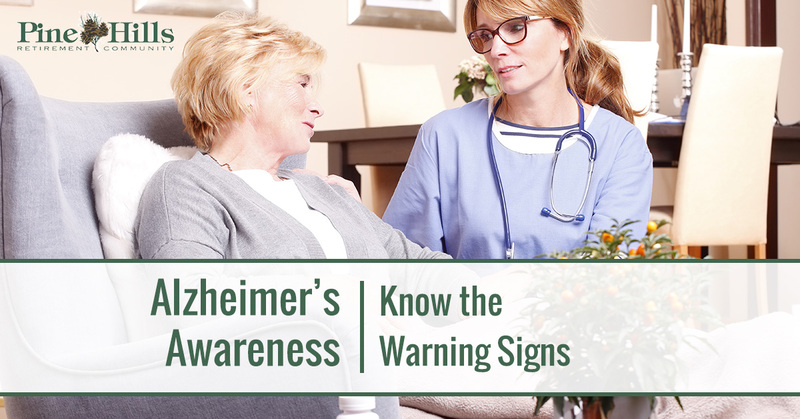 Here are some signs to be aware of that may be symptoms of Alzheimer’s Disease in yourself or your loved one. The initial memory loss may not seem significant at first and can manifest as simple things, such as forgetting where items were placed, forgetting what was eaten for breakfast, and needing to use lists more frequently. However, if someone has trouble remembering where they are or how they got there and who other people are, these are things to be concerned about. Everyone has their routine — the things we do the same way everyday. Everyone you know is particular about some facet of their daily routine. When this begins to change, it is a clear indication that something is altered with memory and cognition. Many people tend to notice changes in hygiene first, but the initial symptoms may be more subtle, such as avoiding tasks that are difficult or require many steps as they can become overwhelming and confusing as memory declines. For those who live at home alone, rather than in a retirement community, it may take a while for friends and family to notice the social isolation. Social isolation occurs as a result of many things, but it may indicate Alzheimer’s disease when someone isolates because it is difficult to drive, carry on a conversation, or remember dates. It may also be embarrassing when there are difficulties communicating that make it easier to just stay in. The perpetual confusion and alteration in brain function that Alzheimer’s disease causes mood swings or permanent personality changes. Regardless of previous personalities, Alzheimer’s disease can cause someone to become confused, suspicious, depressed, fearful, and anxious. Alzheimer’s Disease is a progressive degenerative disease that is generally slow in onset and progression. It can often be difficult to recognize the signs, especially as people age and the symptoms are dismissed as normal aging. Cognitive decline is not normal, and the signs listed above should be taken seriously. This June, for Alzheimer’s Awareness Month, take the time to educate yourself and your loved ones about the disease. While there is no known cure, there have been recent significant advancements and treatments that can stall the progression and allow patients to live a life with clearer thoughts. For more information, contact us at Pine Hills Retirement Community today!